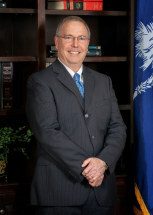 Warren Curtis, Originally from Camden, SC, moved to Sumter in 1995 after earning a B.A. at Dartmouth College and then his J.D. at the University of South Carolina School of Law. After graduating from law school, Mr.Curtis served as a law clerk to the Hon.J.Earnest Kinard, and then in private practice. In 2007, he and William Croft started the Curtis & Croft law firm, where Mr. Curtis focuses his practice on real estate and business transactions, probate and civil matters. Mr. Curtis is a member of the Sumter County and South Carolina Bar Associations and is a member of Alice Drive Baptist Church where he previously served on the Deacon's Board.